Should I lease or buy outright? This is a massive decision and really depends on the business – both now, and at the end of the lease term. Is it better, for example, to pay more per month for a longer period but eventually own a vehicle, or instead pay less for a limited period but not own the vehicle at the end of the period? Perhaps you want the vehicles on a lease purchase basis, so that you have the option of purchasing when the lease concludes? Leasing gives you flexibility when it comes to deciding how many vehicles to replace, and when to replace them. It also, therefore, needs less capital, allowing you to get the vehicles you want for a lower cost and avoid diverting monies that could be used elsewhere. 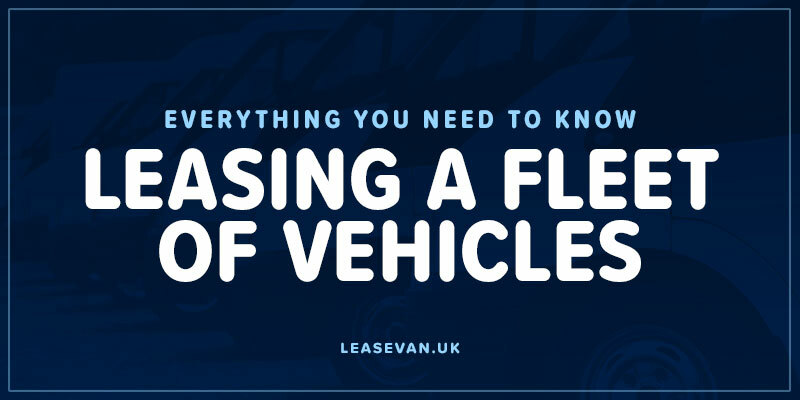 You won’t be stung by a vehicle if it becomes obsolete or unfashionable in the way that a purchaser does; simply return it, at the end of the lease. Buying outright gives you more room to manoeuvre if you wish to personalise or modify your vehicles. For example, we might not let you brand your vans with body paint advertising your business, as you will be returning the vehicles in 2-4 years. Even a blend of buying and leasing, and therefore running a mix of branded and unbranded vans, is not as satisfying as creating a unified image. However, leased vehicles are regularly updated so your employees may be able to benefit from the latest technological advances. If you’re taking on more than one or a fleet, these considerations might be applied to each vehicle in turn, or the set as a whole. You might decide to choose one utility vehicle, such as a Ford Transit or Citroen Dispatch, for all of your vehicles, or instead opt for a blend of vehicles of different sizes (height and length), fuel efficiencies and price depending on the needs of your business. Working out the maths can be complex and it may be better to contact us directly with a list of desirable attributes - eg three pick ups, two vehicles with a minimum height of 1.9 metre and so on - unless you’re specifically bothered about using certain makes and marques. We generally allow you to choose between 2-4 years for the length of lease, with an increased rental cost for the shorter terms. Therefore, the cheapest option is to choose a) the cheapest model with b) the longest lease term. However, there may be penalties for cutting off a lease early, so if keeping the newest models is important to you it might be more cost-efficient to go for 2-3 years instead. There’s a popular misconception that the mileage limit on a van or car is set for you, at 10-12,000 miles a year. However, this is not the case, and paying for a tailored, increased allowance could be beneficial. In some cases it’s possible to let a lessee sign up for 50-100,000 miles or even unlimited distances, across the three years. If your company racks up big miles throughout the lease it is better to plan early and pay for increased mileage; this will surely save you a considerable amount compared to the end-of-lease excess mileage charges. Check with us if we can handle insurance, breakdown cover, maintenance, and servicing. If you lease a van and use it purely for business, then you will be able to reclaim 100% of the VAT, or 50% if it is used for any personal use. These conditions also apply to cars, lorries, trucks, motorbikes, and any other purely commercial vehicles. Reclaiming VAT on fuel is also possible, albeit more complex if any vehicles are driven for both business and private use. Your drivers, if they commute to work, should keep detailed mileage records if applicable; find out more on the official government website. All vehicles should be returned in as good a condition as possible, as it will be inspected. Anything classed as being returned with ‘excessive wear and tear’ may be subject to a penalty. The handbooks should be in place, all keys should be returned, and all equipment in place, as a minimum. Note that a few scratches and scuffs are inevitable, and this should be taken into account. However, returning a vehicle with scuffed bodywork, damaged interior and upholstery, cracked mirrors, and scuffed alloys is a sure fire way to incur a charge. Across a group of vehicles those charges will soon add up, so it is incumbent on drivers to be responsible when out and about. For more guidance on this consult the guide created by the BVLA (British Vehicle Rental Association) as to what constitutes ‘fair wear and tear’. According to Business Car Manager, estimated end-of-lease damage charges for the UK’s top 50 contract hire and leasing companies - in effect compensation for returning a vehicle in a condition below that outlined in the lease agreement - added up to £45 million for small businesses to fleet budgets in 2012. Overall, it should be a smooth process, since most information is listed clearly and easily, so you should be able to put together an approximate idea of costs before buying. As ever, the most precise way of eliminating problems and misconceptions is to contact us directly to clarify any issues.